I love posting vintage photos for you guys, but this fine Monday I have something a little extra special. My parents are in town visiting and we spent the weekend driving around San Francisco and went to Golden Gate Park. I have to say I love seeing San Francisco through the eyes of visitors. Our city is like no other! Greg showed me this a while ago, and I was completely entranced. 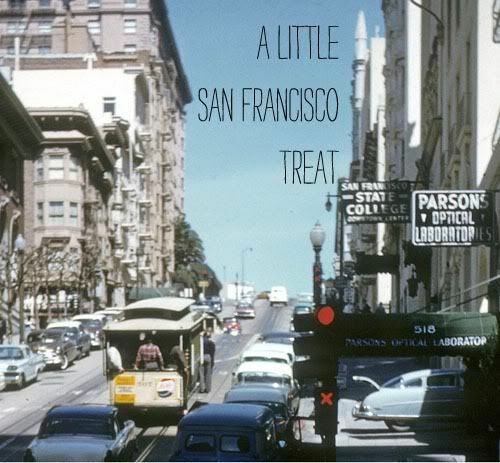 Vintage footage of San Francisco, shot on Super 8, with a dreamy modern soundtrack by Air. Ahhhh! You’ll see it all, the iconic cable cars, Coit Tower, Chinatown, the Bay Bridge, Lombard Street and of course the lovely Golden Gate bridge. This is my city as it was in 1958. Happy Monday! Tagged with 60s, vintage San Francisco. Thanks for posting this. I saw it a while back and tried to find it and couldn’t. I love the “Chop Suey” sign in the Chinatown shot. So nice to see tourists dressing up for their day in SF! that was fabulous…i luv how the people looked so fashionable….! I love this video! I gotta say I love the music, too. San Francisco just speaks loveliness.